Google Glass–will this platform be ubiquitous? I attended a Google Glass Meetup in DC last week and was very impressed. I’ve not seen this much interest by developers in a platform since the launch of the iPhone SDK in Feb 2008. I learned early on when I was working at MSFT that a platform will be successful if it is viral with developers—something I believe MSFT has lost over the last 10 years (possibly more on that in a future blog). This new Glass platform already seems to be becoming viral. Can they continue to grow momentum? I personally don’t think that Glass (or competitors to Glass) will be as big a market as the smart phone but I do think it will be substantial. I say this because Glass in many ways is really an accessory to a smartphone much like a Jambox or Fitbit. That being said, it is a lot more functional because apps will be designed/developed for it exclusively. The apps don’t run on the glasses, they are essentially HTML pages (they call them cards) that are hosted at Google and called via API (there is no SDK). I would think that this would make it very difficult to build the types of games that smart phone users are accustomed to… Makes me wonder—without a large number of games, what drives the initial momentum? However, I’ve come to the conclusion that there is enough momentum via smartphone users and productivity apps, so it won’t matter. More here. Some of what I was thinking about while I watched the demo: I’m an engineer at heart so I like to think of things within frameworks. Let’s first look at why smartphones are successful and eating away at the laptop/PC market share—I created what I’ve called the value pyramid (see graphic below). Think about laptops versus smart phones and tablets within this framework; I believe laptops/PCs are losing market share because a majority of what has tied people to a desk the last 20 years can now be done via a smart phone / tablet. Laptops are still very important devices for collaboration and creation but not for all the other layers of the pyramid. 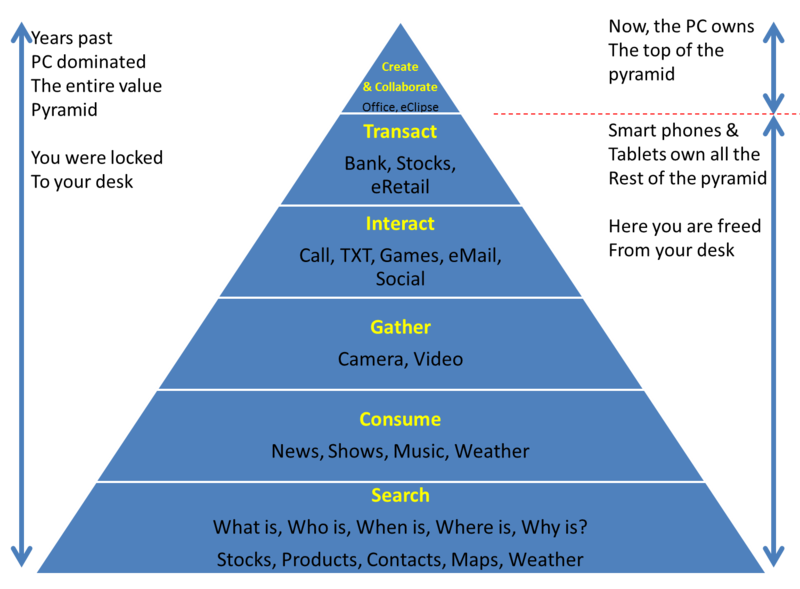 When thinking about a product like Google Glass against such a pyramid, I start to wonder if the device will make the functions of the lower levels of the pyramid easier or will it start to effectively erode the collaboration/creation level. 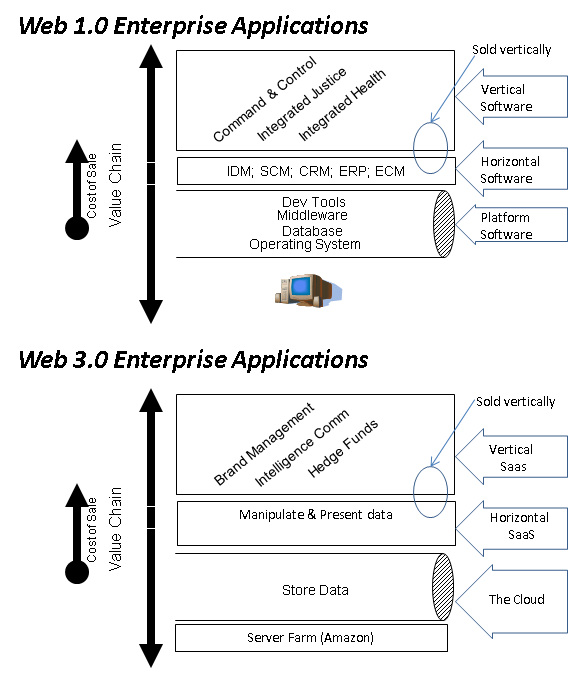 My take is that the latter will be very hard to do given limited user experience. So Glass must make the lower levels of the pyramid even more productive for a user in order for the device to be become ubiquitous. At first I want to compare using the Glass experience to what I do on my smartphone… When does it make more sense to use Glass versus my smartphone? Search: I’m the kind of person that is always asking Google who, what, when and where questions and if I could do that easily without pulling out my phone it would be worth the investment (I have an 11 year old and he asks me a ton of questions). It is also clear to me that having the knowledge of what is around me is interesting as well and can be leveraged. Consume: I’m not sure about this one. I think I’d use the device to consume content if I owned it but I’m not sure I’d invest in the device to get my New York Times. Am I wrong? Transact: I doubt I’d use the device to do a bank transaction or to sell stock or to buy something on Amazon, but I’m open…. So do I think the device will be successful? Yes! Why? Because just the baseline Search is a value add worth paying for. Do I think it will be ubiquitous? Maybe. I think that comes down to Glass’s ability to help people interact with their environment. If it makes me a better golfer there is no stopping its growth 🙂 . Many others in the industry think this is going to be huge as well–IHS, a forecasting firm, estimates that shipments of smart glasses, led by Google Glass, could be as high as 6.6 million in three years <see here> and Google Ventures Launched a Glass Collective With Andreessen, Kleiner Perkins to fund Google Glass startups—all great signs that this is a new / important platform.